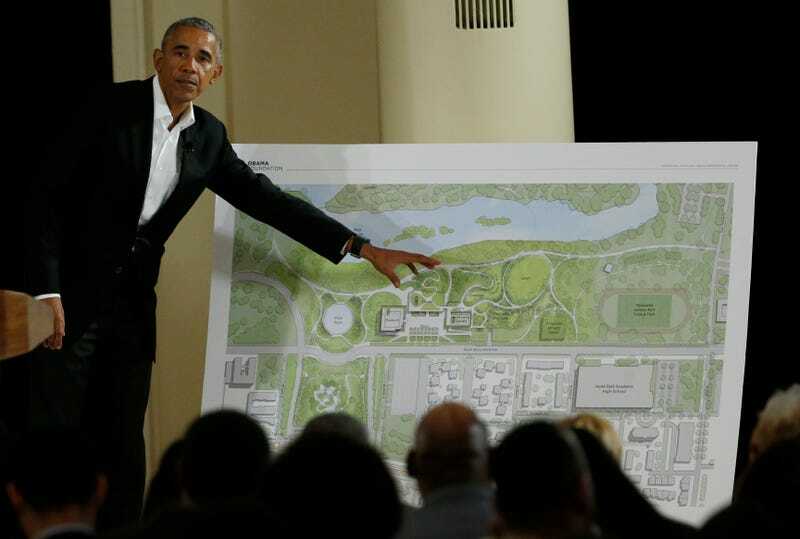 Today the former president unveiled his plan for an innovative complex that he hopes will turn Chicago’s Jackson Park into a destination area, according to reports by USA Today and the Chicago Sun-Times. Obama said that he hopes the sprawling complex, designed by husband-and-wife team Tod Williams and Billie Tsien, can reverse the area’s high crime and make it a destination where artists like Chance the Rapper, Bruce Springsteen and Spike Lee can teach young people about film and music. The campus will be surrounded by the historic park and feature three buildings: a museum, a forum and a library. The museum will not only house exhibitions and office space but will also contain meeting rooms for education and training. Obama’s foundation is looking at hosting a branch of the Chicago Public Library on the campus and will focus on sustainability. The glass-and-stone center will cover over 200,000 square feet and will feature rooftop views of Lake Michigan. The entire project is expected to be completed by 2021 and is expected to cost $500 million. As with all presidential libraries, the funds will come completely from donations.